This year my family is hosting a pickup site for Farmhouse Delivery CSA, which means that each week we have not only our own CSA share to enjoy, we also have the opportunity to buy additional produce at a great price. This week it was broccoli - loads and loads of beautiful, gigantic heads of broccoli came to harvest this week, and the CSA offered it to customers for the low, low price of just $2.00 per head. We're not talking about the precious little clusters of broccoli at the grocery store. No - these were each 10"-12" across and weighed about 2 pounds. "I don't know what I'd do with that much broccoli." So, I'm here today to tell you what you should do. Not that I'm the boss of you or anything. Step 1: Buy all the broccoli. Soak it in some salt water to exterminate any hitchhikers. Cut it into pieces that are about the same size so they will process in the same amount of time. Step 2: Blanch all the broccoli. Drop the broccoli in a pot of salted boiling water and boil for 2-4 minutes. Then scoop the broccoli out and dump it into a pot of ice water to stop the blanching. Leave it in the cooling pot at least as long as it was in the boiling pot. This process denatures the enzymes that cause the food to turn brown and mushy in the freezer. Step 3: Flash freeze all the broccoli. Drain the blanched broccoli and lay it in a single layer on a lined baking sheet. Put the sheet in the freezer until the broccoli is frozen. Doing this prevents the pieces from sticking together. Step 4: Bag, tag, and return all the broccoli to the freezer. Remove the broccoli from the baking sheet and put it into a freezer-safe bag. Remove as much air as possible from the bag to help prevent freezer burn. If you have a vacuum sealer, this is the perfect use for it. BAM. Done. If you process just one head of broccoli you can be done before a pot of coffee has finished brewing. If you do 7, as I did, you can be done by the time a load of laundry finishes drying. ProTip: In Step 2, you will need one big pot of salted water and one big pot of ice water. Don't use your good ice. You need it for your sweet tea. Instead, fill an empty drink bottle with water and keep it in the freezer. 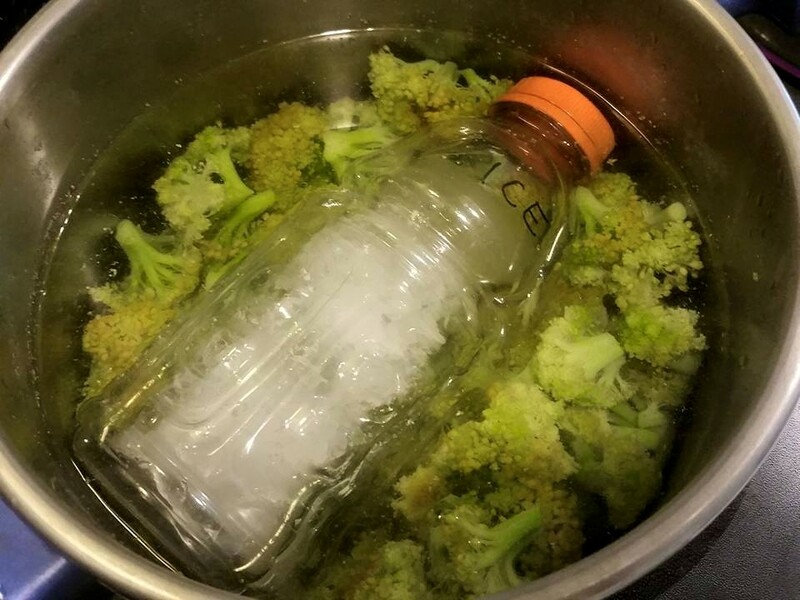 When you need to blanch something, use the frozen water bottle to chill your cooling pot. As long as you don't break the bottle, you can just wash it off and put it back in the freezer to use over and over again. It makes a great picnic cooler ice thingy too. Label your bottles so your family doesn't wonder why you have a dozen different containers of unidentified chemicals in the freezer. Handmade Handkerchiefs. That's how I roll.